Misaki Cramer and Andrew Johnson and Zena Demapan and Phalai Frink ruled their respective divisions in yesterday’s Marianas Junior Cup Under-19 Beach Volleyball Festival at the Fiesta Resort’s beach side. The Saipan-born Cramer, who is now based in Guam, teamed up with Johnson where they bested 10 other pairs in the boys’ division. They swept all of their four matches, beating T.J. Eina and Nak Nakashima in the finals, 21-17. It was Cramer and Johnson’s second straight win over the Eina-Nakashima tandem as they also scored a 21-11 decision in the early stages of the tournament to clinch the first finals berth. Cramer and Johnson also defeated Sammy Litulumar and Kimo Olopai, 21-16, and scored a 21-4 triumph over Billy Hinson and Karlo De Leon. Johnson had no difficulty shifting to the sand court after he previously won an indoor boys’ volleyball crown with the Saipan International School Geckos last year in the Marianas Interscholastic Sports Organization. Eina and Nakashima opened their campaign with a 21-19 win over A.J. Hambros and Joshua Andrew then followed it up with a 21-19 decision against Jonathan Jonah and Quintin Ramsey. They lost to Cramer and Johnson to drop to the loser’s bracket where they needed a 21-18 victory over Hinson and De Leon to arrange a finals date with their tormentors. It was also the same story in the girls’ side with Demapan and Frink sweeping their four games to beat 11 other pairs. Demapan and Frink had an easy road to the finals and quickly dispatched Nilani Cepeda and Julie Reyes, 21-5; downed Nicole Arenovski and Adele Hudkins, 21-11; and trounced Lauren Alegria and Aimi Iwan, 21-7, to secure the first finals spot. Arenovski and Hudkins, who started with a 21-11 decision over Russell Juvan and Rustine Valina, had a longer route after dropping to the loser’s bracket. They squeezed out a 21-19 win over Knohlynn Gechig and Sabrina Pangelinan, scored an easy 21-5 victory against Emily Jones and Beryl Kohnen, before completing a 21-11 decision over Alegria and Iwan to move on to the finals. The champion pairs then teamed up with professional players in an exhibition match, which was still being played at press time. 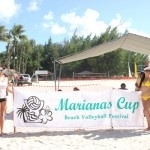 The 23rd Annual Marianas Cup Beach Volleyball Festival continues next weekend with the Marianas Kids Cup U13 and U17 divisions.